A global renewable energy transformation is underway. The proposed merger between Tesla and Solar City outlines the shape of things to come. The integration of solar panels with battery storage and electric vehicles is the paradigm for both ecological global economic growth, and reaching the goals of the Paris Climate accord. An integrated renewable energy company will combine electric vehicles, battery storage, and solar electric panels, all with rapidly expanding market share and plunging prices. Globally, investment in cheap and carbon free solar energy is already rapidly supplanting fossil fuels. Whether or not Tesla’s corporate reorganization proceeds, this is the model for a global renewable energy company with a comprehensive and compatible product line. Profit driven renewable enterprises need sensible encouragement by fair market and utility rules, not carbon taxes, in order to continue to rapidly transform the global energy balance. Regulators and politician need to support, not sabotage the renewable energy transformation. Instead of economically destructive and costly carbon taxes that would put a break on all economic activity, what’s needed is using the already successful renewable portfolio standards (RPS) mandating an ever increasing percentage of renewable energy. The more renewables that are built , the lower the cost, the less pollution,the more good community jobs are created. California and its utilities and regulators are a good example of how we are moving rapidly toward a renewable turn. California Utilities like PG&E and Southern California Edison have seen the future and it’s renewable. They’re investing big time in electric vehicle charging stations at the same time the state, led by Gov. Jerry Brown, mandates the phase in of more renewable power.The utilities understand that the renewable future mean more, not less, electric sales. And it’s companies like Tesla, Faraday Future, China’s BYD, and Mercedes that aim to provide the vehicles to take advantage of this electricity and charging stations. And the batteries on these electric cars can also plug into the grid and your house to help provide supplemental power. California regulations use RAM (Renewable Auction Mechanism) with competitive bids to help finance renewables,employing market forces to help keep pushing the cost of renewables down. Wall Street investment in renewable energy is now far greater then in fossil fuels.Peabody Coal is bankrupt. On the same day the Solar City -Tesla merger was proposed, PG&E announced the planned shut down of Diablo Canyon, California’s nuclear last nuclear plant. The sun is rising. Politicians and regulators need to assist our renewable entrepreneurs, workers and their unions, and communities hungry for clean sustainable jobs. We are witnessing the dawn of global ecological economic growth. 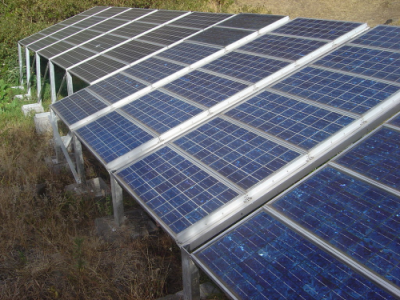 “Guidelines for implementing India’s plans for 20GW of solar capacity from “Ultra Mega solar power projects” in 25 parks have been published by the Ministry of new and Renewable energy (MNRE). “Blue Energy is to build Africa’s largest solar photovoltaic (PV) power plant in a move which could spark a renewable energy revolution in West Africa. The giant 155-megawatt Nzema project will be one of the biggest in the world – only three solar PV plants in operation today are bigger. It will increase Ghana’s current generating capacity by 6% and will meet 20% of the government’s target of generating 10% of its electricity from renewable sources by 2020. “Quietly, the prince is helping Saudi Arabia—the quintessential petrostate—prepare to make what could be one of the world’s biggest investments in solar power.